Click here to view a slideshow of the Labyrinth. Several years ago when my Dad was being swallowed by Alzheimer’s, I began a search to find anything that might help to slow his disease. I was touched by a story of a couple that had walked, hand in hand, through the labyrinth almost daily. He was suffering from Alzheimer’s, and she was struggling with the confinement, stress, and isolation of being a caregiver. She noticed that after a few weeks of their routine, he began to regain small skills. I also read a story of a school using the labyrinth of the church next door to “entertain” a group of disruptive students during the morning chapel meetings. The teachers and parents were amazed that not only did their behavior improve, but also did their grades! The teacher also noticed that they were more focused for the day. Many hospitals are building labyrinths for their patients and families, and MAYO has several surgeons that will not attempt a serious operation without first having walked the labyrinth. Is it the exercise, the repetitive motion that unlocks a part of the brain, or just a time to calm the soul? 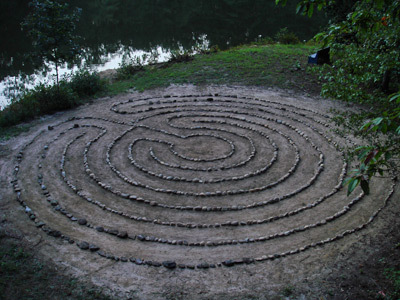 The Labyrinth represents a spiritual journey…a path to our own sacred inner space. It is based on a spiral patterns found in nature. A labyrinth is journey to quiet the mind and open the soul. It can be a revealing path or just an enjoyable walk. Visit often and discover your own true path.